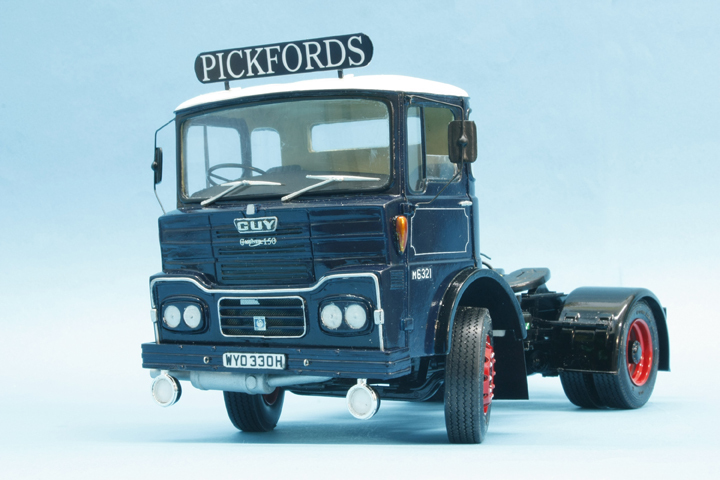 I like to build a model of the Lorries I drove in the past but mostly none of them have been done by the major manufacturers. When KFS did the Volvo 88/89 I was first in the queue and more recently Kingdom trucks of Northern Ireland did the Big J Guy artic so, as I had a real one when I worked for Pickfords here was another opportunity. 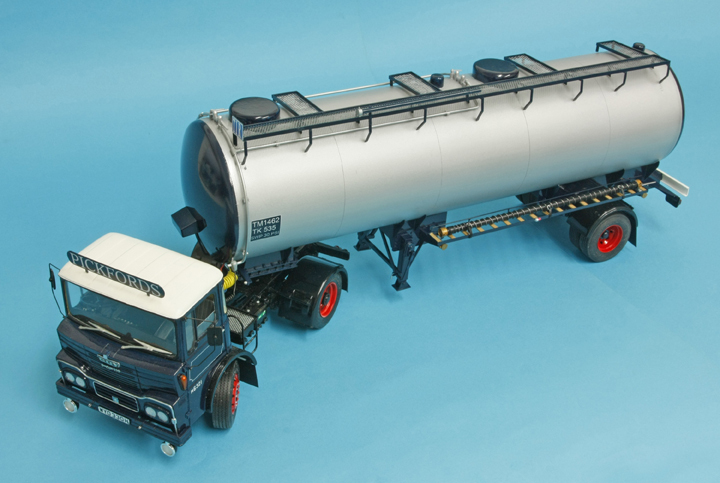 I had started to scratch build a tanker trailer for this lorry some 30 years ago hoping a Guy would soon be released but it never was so it lay forgotten in a box under the shelf. 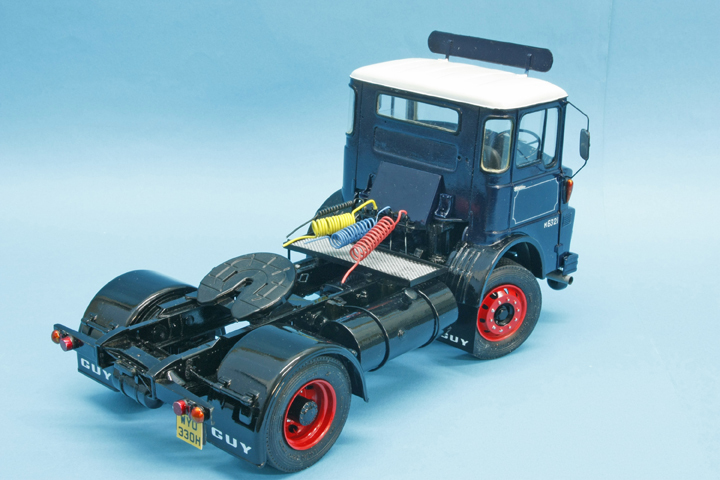 When my kit arrived I discovered a very fine resin cab and some nice attachments, a fully detailed interior and some fittings for the intended chassis, I also discovered that it was a later Mark than mine as it had the big radiator box on the front of the cab to accommodate the larger engines that some models had, fortunately it was a separate item so it was easy to leave off the basic cab and to convert it to the version I drove. My first job was to sand/scrape off the two air vents at the sides of the grille and then scrape out the top centre section deep enough to lay a sheet of 20thou plasticard in there. 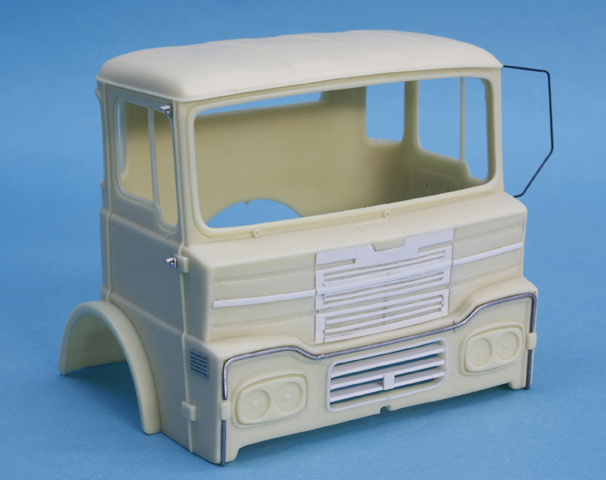 The centre panel on the real truck is removable so I made the card just a tiny bit narrower than the space available to give a “panel line“ effect this was then carefully marked and cut to represent the grille before being glued into the centre. The lower centre section had a large hole drilled, sawn and sanded then a strip of 30 thou card was cemented around the inner edge just proud of the surface to represent the chrome strip and three bars made from40thou card cut and cemented in these were reinforced with a dab of superglue before the tiny square of thin card was added ready for the Leyland badge. There is a chrome strip around the lower front edged, running from sidelight to sidelight, as there is a nice groove moulded on the resin I used 1mm solder wire to sit in the groove this was later painted silver with Humbrol # Hu.11. 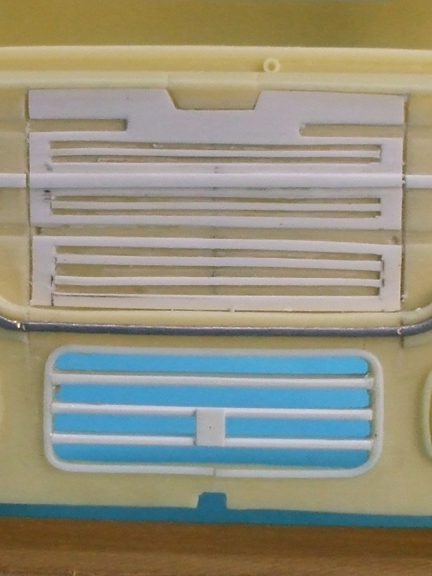 A thin sheet of clear plasticard is supplied for the windows and patterns are printed on a sheet of paper to guide you, around each window hole in the resin is moulded the rubber strip to locate the window as close to the surface as possible but the inside lip will need a little cleaning up to allow the “Glass” to fall into place and I used a #15 scalpel blade to ensure an even surface, just a small thing to make life easier when they are finally put in. 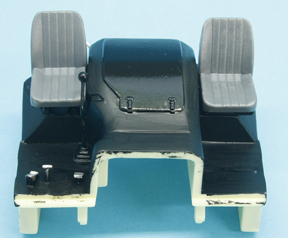 The floor and seats are all a good fit, the dashboard drops into place with ease then as a little refinement I added the hand brake and its associated pipes to the steering column from plastic rod and telephone wire. 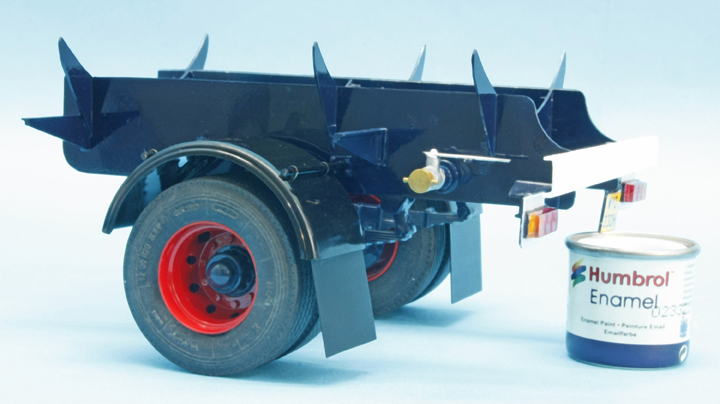 Parts are supplied for a rear mounted header tank and air breather filter but my vehicle never had these so were discarded but I did fashion a rear engine cover from 20thou plasticard at the base of the cab as per any tanker lorry would carry as a safety feature. 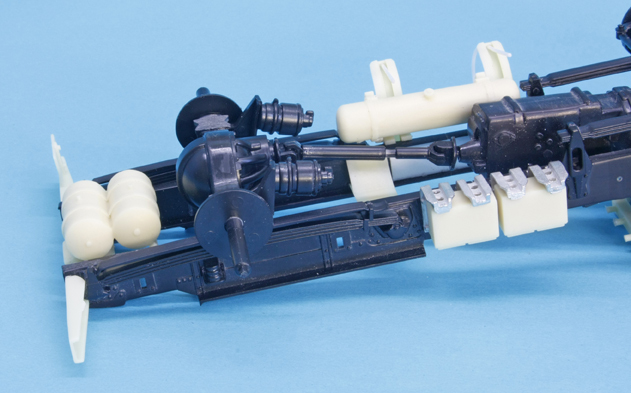 The Volvo donor chassis was shortened and altered as instructed on the sheets with the precise measurements given and then all the resin and white metal parts were added. 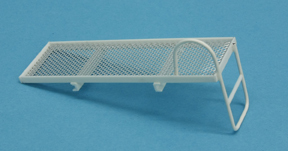 The Batteries will need a bracket of some description added to keep them secure; I have seen several different types so check the vehicle you are depicting. 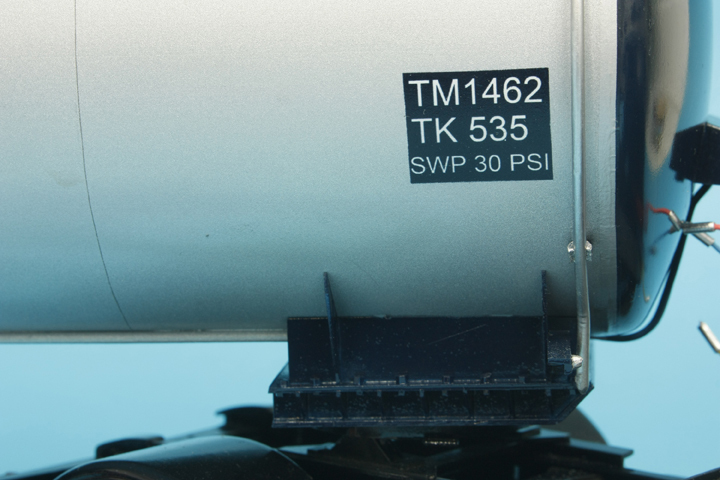 When you fit the fuel tank make sure that the top of the filler neck is a shade higher than the top of the tank or the driver won’t be able to get a full tank, this will put the fuel gauge half way up the tank. 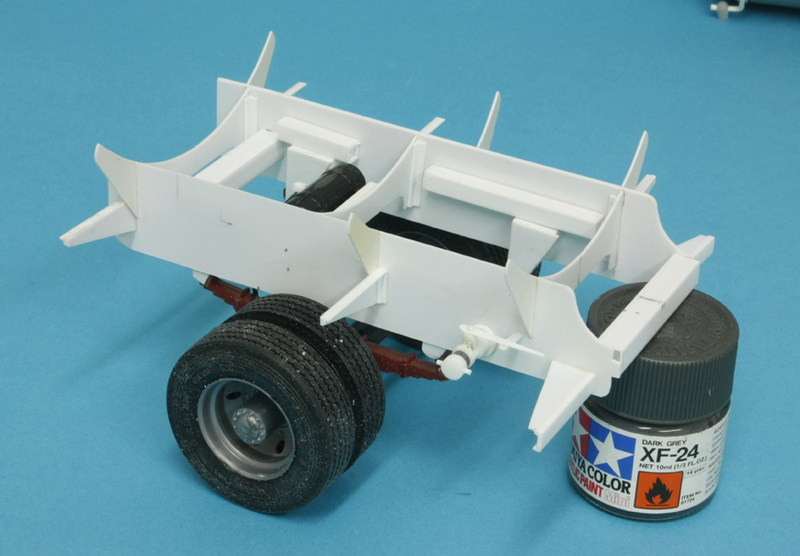 My vehicle had a small cat walk across the chassis and I constructed one from Plastruct TB1 tube and A2 angle, the mesh to walk on was expanded steel on the real thing so I used the expanded aluminium mesh from a fry pan anti splash guard from Woollies. 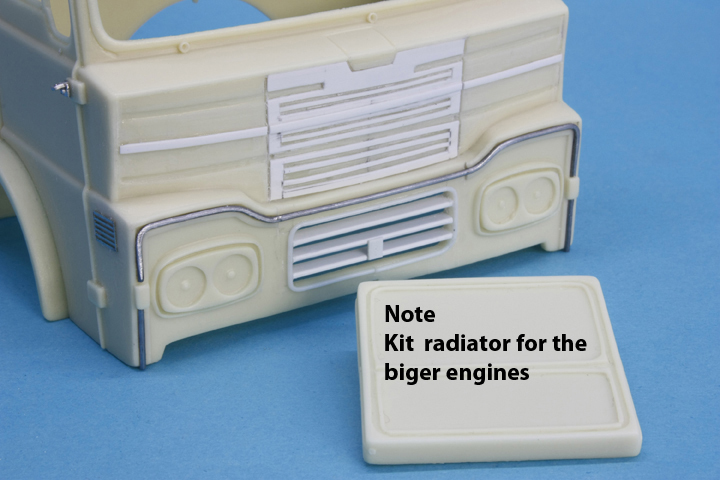 I did one other mod to the kit parts I shortened the Exhaust silencer box, as I only had a 150 Gardiner engine it didn’t need the long one fitted to the likes of the Cummins engines. I also needed a headboard for the Pickfords name this was cut from 15thou plasticard with two angle brackets to support it. 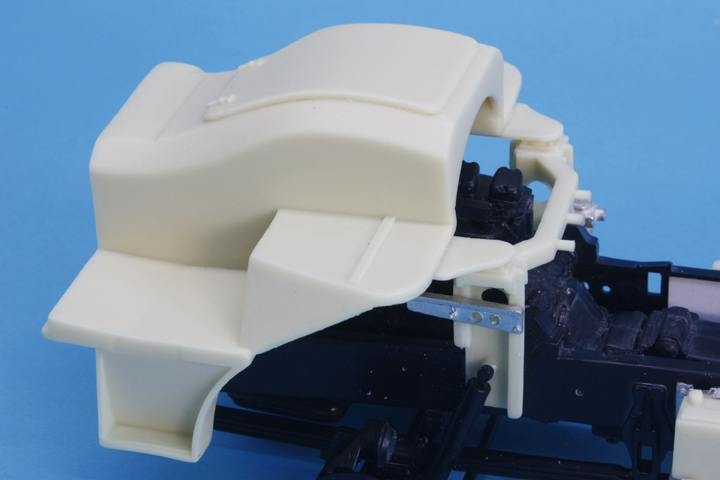 My interior was given a coat of light cream but light grey would also suit, the metal parts of the door interiors would be the exterior colour with the “plastic” covered panels semi matt black Hu 85 as would the engine cover and dashboard , my seats were a medium grey. 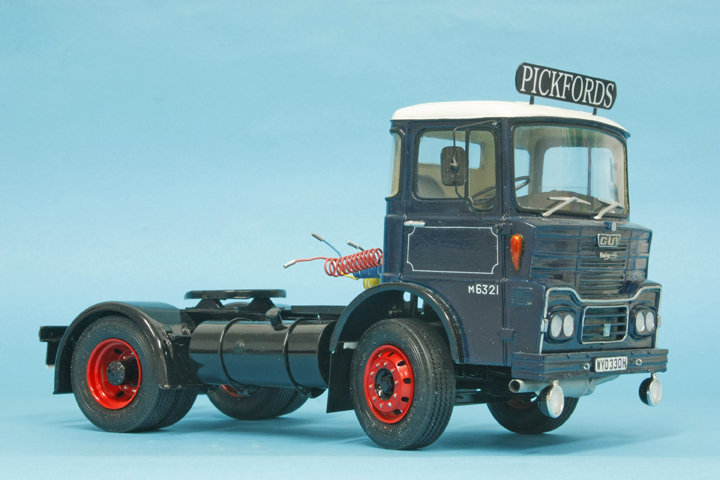 Pickfords Blue is not available in the Humbrol range but Phoenix-Precision paints have it and BRS red in their “Cherry” range, they are on the web. I sprayed the cab with a couple of coats of Hu 130 satin white as a base coat and for the roof which I then masked with Tamiya Tape. The blue was sprayed as a very thin mix and given a couple of coats to give a good strong colour after which I added a good coat of Revell #1 gloss varnish and set aside waiting for decals. 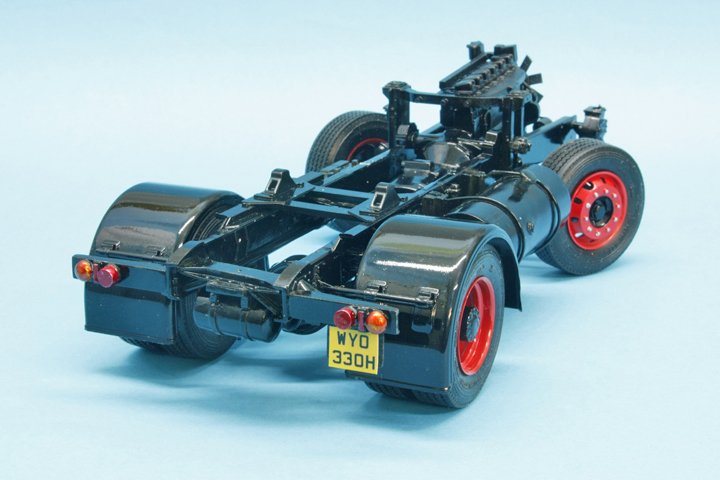 The chassis was sprayed with Hu21 gloss black but the mudguards and fuel tank were sprayed separately to make it easier for the chassis frame, the wings on the cab were brush painted with the same gloss black. 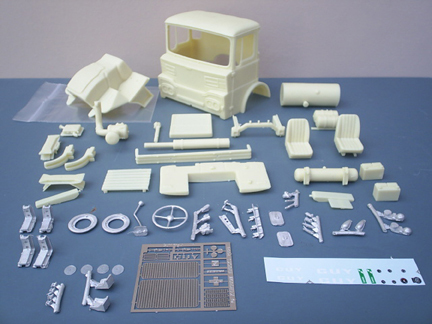 All the wheels were given a coat of Hu130 white before covering with bright red Hu19. 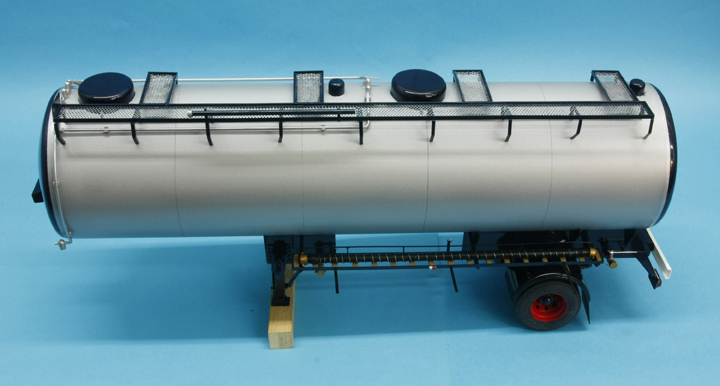 The tank was a 4,000 gallon capacity vessel with two stainless steel compartments for the carriage of edible oils. I eventually found the box with the forgotten tanker model in it and to my surprise all my drawings and notes were there as well. The tank was constructed but none of the fittings were made nor was the Chassis so work began in the spares box, first item to find was an axle and springs I am not sure which kit they came from but some small alterations made them suitable for my purpose, wheels also came from the spares box but needed some modification to make a non driven pair. I cut the extension for the outer wheel off the inner wheel of an Italeri rear set leaving a flat surface to which a suitable hub can be added then I use an Italeri “spare” rim to which I add “wheel nuts” from hexagonal rod over each hole this is then added making sure that the large holes in the rims are opposite each other so the air valves can be reached. Next job was to make side frames from 40thou plasticard with cross members and locations for the springs from square fineline tubing. The side frames were taller than needed and were later adjusted to the correct ride height. 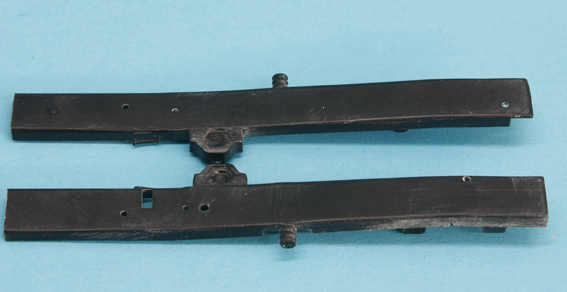 The coupling pin plate was built up from various thickness plasticard with the nuts and bolts needed cut from Fineline hexagonal rod and cemented in position. 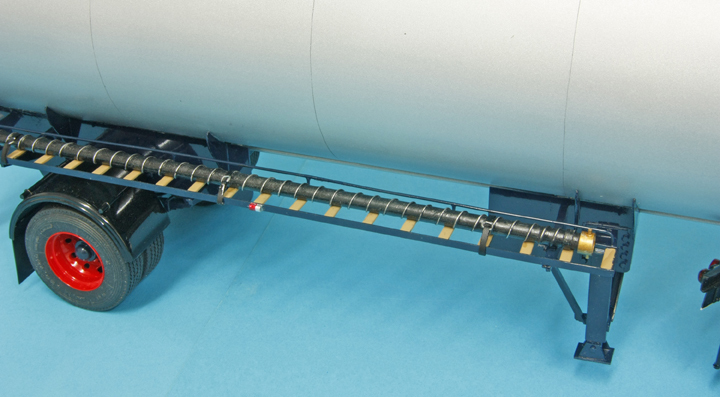 All the curved tank supports on the three major components were made using a spare piece of the tubing left over from the tank to give the correct matching curve drawn onto tracing paper which was then laid onto the card and with a sharp point pin pricked the shape onto the card which was then cut out following the tiny depressions. 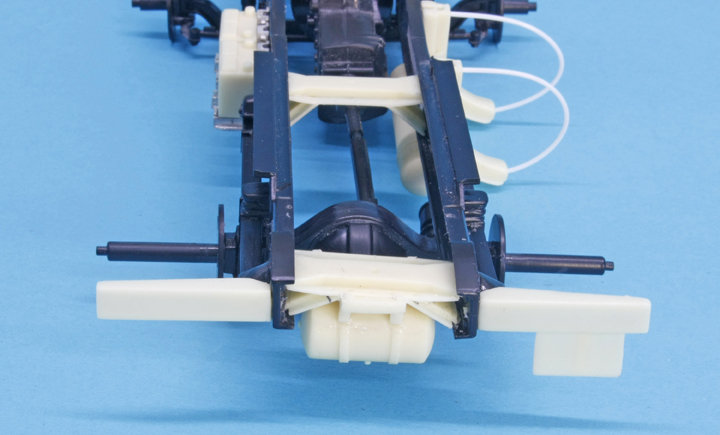 The legs were built up from two sizes of square fineline tube with angle bracing, the supports were cut from 40thou card along with the side frames which are longer than usual because the front outlet is placed there much the same as the rear outlet is on the running gear frame. 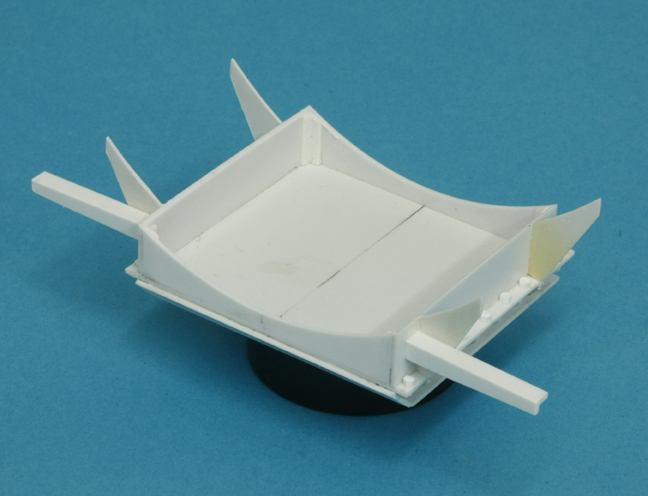 Once the front component was temporarily fitted the tank was coupled to the unit and the height of the rear side frames adjusted so there was a slight slope on the tank. 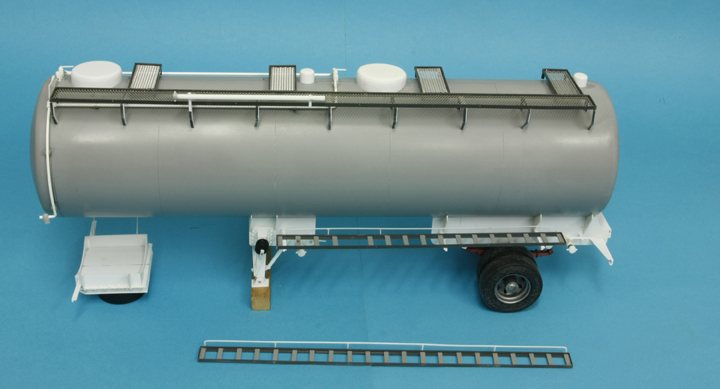 The load in this tank is discharged under pressure so an air line pipe was formed from Plastruct TB2 tube which has brass rod inside it and will retain whatever shape is made, the inlet pipe runs up the left hand side of the tank and into the top of it via a valve and an extension to the rear compartment via another valve a similar arrangement for the outlet pipe is on the right side with two safety release valves between the top two, the clips and “T” joints are also from the Plastruct range. To make the two man hole covers I cemented a strip of 20thou card around an 80thou disc then another 80thou disc, slightly larger, was added to the top and left to harden. 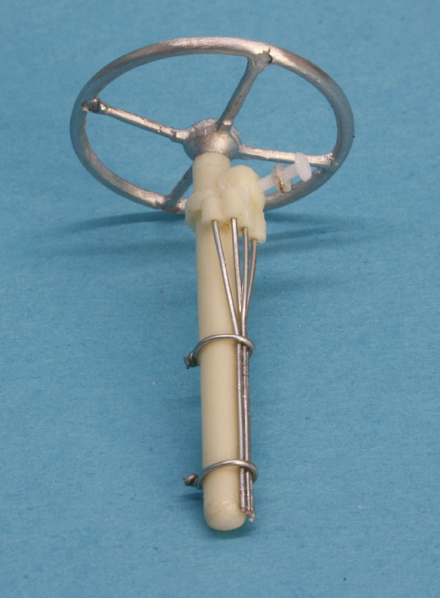 The covers for the foot valves (the two small lids) had a disc cemented to a piece of small tube, later the shoulders of these four items were sanded to a rounded shape to give a domed effect. 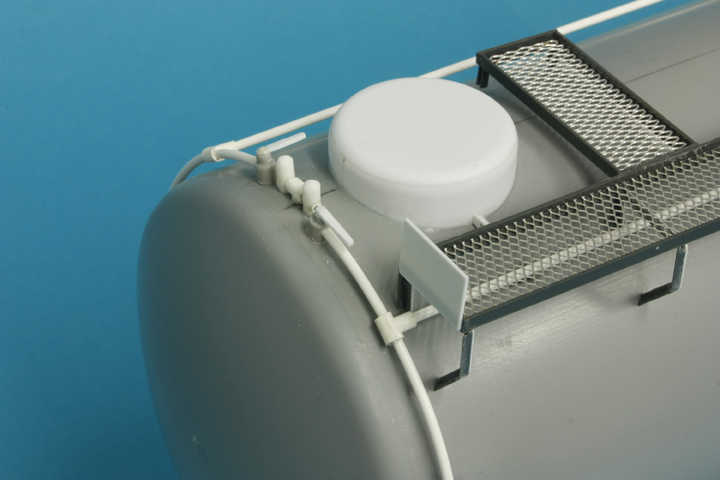 The lower edges of the lids were shaped to match the tank by wrapping a sheet of sandpaper around the tank and rubbing them back and forth on it until they fitted. 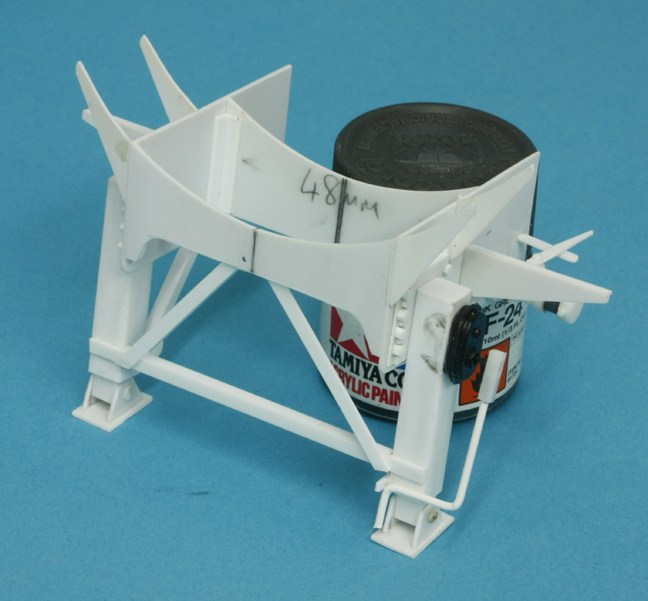 The catwalk was made using A3 angle and expanded mesh similar to that on the unit with the supports from A2, a tube for the dipsticks was fashioned from fine tubing and mounted on the side while the ladder was made from a length of TB1 bent into a long “U” shape with steps from bits of 40thou plastic rod. 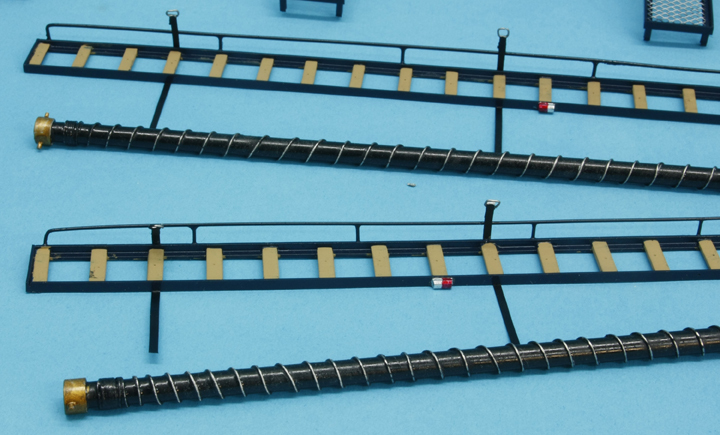 Hose racks are needed on both sides and these can be made from A3 angle but this time fill the centre with lengths of 3mm strip to represent the wooden battens on the real thing. 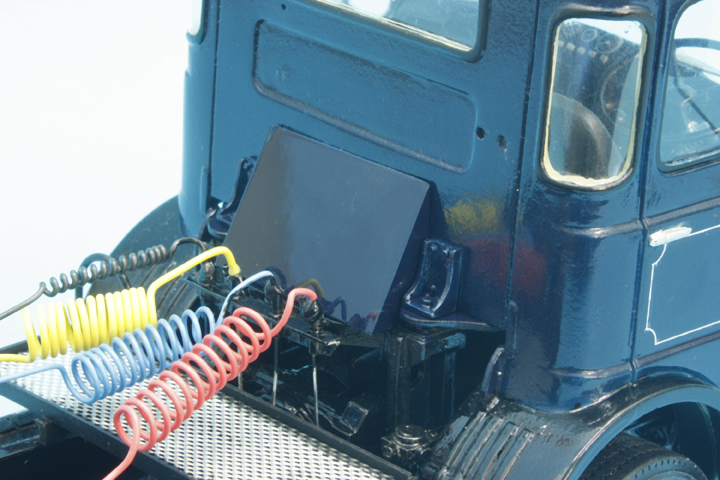 Hoses can be made from tubing with fine lead wire wrapped around and couplings from odd bits of tube added on the ends. 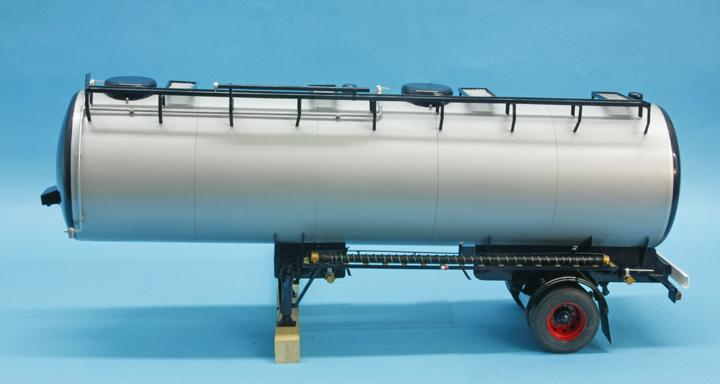 Painting and finishing, the three main components, the covers and the ends of the tank were sprayed blue separately then the tank ends were masked off and Humbrol matt aluminium from the Metal Cote range was sprayed on the main body and pipework, later a coat of Johnsons Klear was added to seal it. All the components were fitted using epoxy resin for extra strength and to avoid disturbing the paint, once they were on the discharge pipes and valves were made from scrap rod, pipe and strip then positioned before placing the hose racks on the brackets. 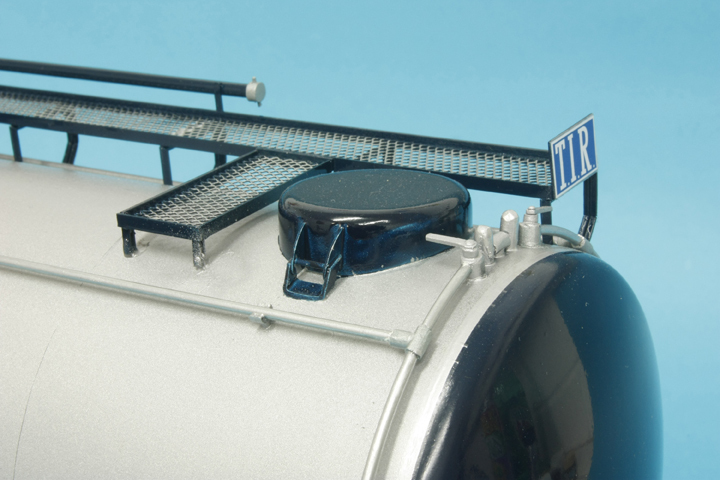 All the usual furnishings for a trailer were built from scrap plasticard such as rear light, reg plate plus front sidelights arms and a box for the suzie couplings on the front. My decals were made on a computer using Experts-Choice white decal paper from Bare Metal Foil Co.
All in all a very satisfying model of one of my old trucks brought to a conclusion after 30 years in hibernation.